Samford University’s Leslie S. Wright Fine Arts Center continues its Signature Series March 6 with Mummenschanz. Show time is 7:30 p.m.
Tickets start at $15 and are free for Samford students and employees. Non-Samford students can purchase tickets for $10. Tickets can be purchased either online or by calling the Samford Arts box office at (205) 726-2853. Box office hours are Monday through Friday, 9 a.m.-5 p.m. Tickets may also be purchased in person at the box office located in Samford’s Swearingen Hall. For more than four decades, Mummenschanz has captivated audiences worldwide with its groundbreaking nonverbal theatre of movement and transformation, according to Cristina Almanza-Muro, Wright Center director of external relations. Mummenschanz conjures a magical world, full of possibilities, without uttering a word. The entire program of sculptural puppetry and visual antics is performed without music or sound. In a surreal comic universe, everyday objects such as toilet paper, wires, tubes and boxes spring to life to become fantastical characters. Abstract forms and ordinary shapes interact in surprising ways to reveal timeless truths about human connections and relationships. The troupe’s playful and memorable exploits display an enormously inventive use of forms, shadow and light as well as creative manipulation of sculpture, expressive masks and abstract shapes. The result is a visually stunning show that sparks the imagination and transcends cultural barriers. 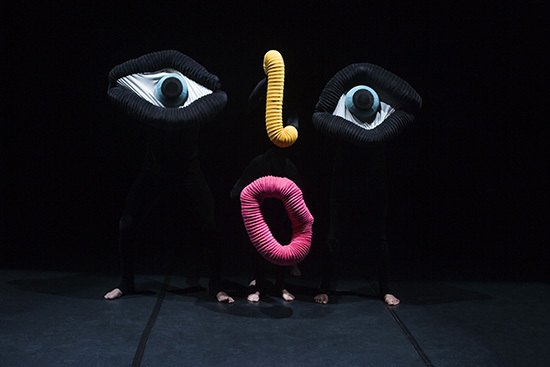 Formed in Paris in 1972 by founding members Andres Bossard, Floriana Frassetto and Bernie Schürch, Mummenschanz paved the way for nonverbal theater and multiple new genres. Since then, the group has established its legacy with tireless touring across five continents over four decades by the original artists as well as current featured players, Philipp Egli, Pietro Montandon and Raffaella Mattioli, and technical directors Jan Maria Lukas and Dino de Maio. The visually stunning spectacle is a form of family-friendly entertainment that sparks the imagination, transcends cultural barriers and dazzles audiences and generations of fans around the world. “Bring the entire family or plan a date night that will never be forgotten. It is an experience that you will remember for years,” Almanza added. The program will be preceded by an outreach school show on Friday at 10 a.m. to more than 500 school aged kids from the Jefferson County area. The Signature Series is made possible through the support of the National Endowment for the Arts, South Arts and the Alabama State Council on the Arts. The Wright Center Signature Series is brought to you by sponsors like Weld for Birmingham, Birmingham Mountain Radio, Yelp! Birmingham and Taziki’s Mediterranean Café. Samford University also is a partner of Create Birmingham.